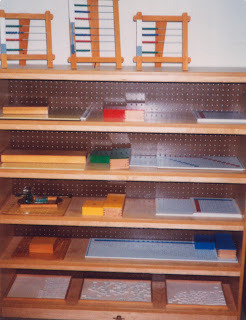 As promised, a few more pictures of my elementary Montessori classroom. 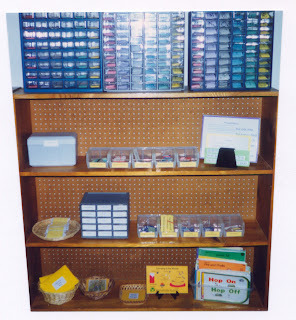 As I browsed through the pictures, I noticed a few things that I used to do with the materials to make them easier to organize and display. I’ll share that info at the end. Enjoy! Looking through these pictures really brought back fun memories for me. I really tried to make our classroom as interactive as possible. For instance, next to the lizard cage was a book about anoles (the specific type of lizard we had). The kids loved to take the book off the shelf and read through it. That way, they really knew something about the animals in our classroom. Likewise, a magnifying glass next to the fish tank was a nice addition. 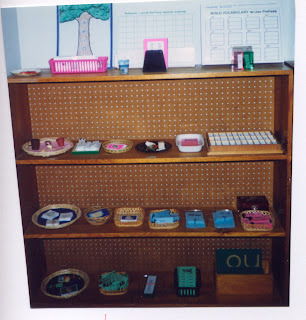 It seems like you can never have too many trays or baskets in a Montessori classroom! One trick that Sister Mary taught me was to use the wooden lids of materials (movable alphabet, bead bar box, etc) as trays. You can see in the math picture that I’m using lids as trays to hold the answer tiles for the addition, subtraction, multiplication, and division equations. This makes it really easy for the kids to find the answer they need. I love to use the flat, round baskets that you can find in the houseware section of Walmart or Target. I think they’re meant for paper plates (at a picnic), but they are inexpensive and just the right size for the shelf. They’re nice in the language area with a circular piece of pink, blue, or green felt inside them. Another thing I just love is picture frame holders. These can be plastic, wood, or metal and are found in craft stores in the picture frame aisle. They are great for books, laminated cards, charts, and other flat materials that would get lost if they were just set on a shelf.